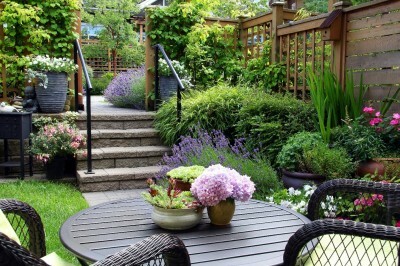 How to Turn Your Garden into a Beautiful Summer Oasis - Legends Landscape Supply Inc.
During the warm summer months, your garden becomes the focal point for fun at home. To make sure that you get the most out of your yard, we’re going to give you some expert garden tips on how to transform your yard into the perfect oasis! Keep reading for great summer garden tips! There’s nothing quite like cozying up for a relaxing evening by the fire! With a wide selection of designs and fuel options, adding a fire pit, fire table, or fireplace has never been easier. Adding a fire feature to your garden creates an inviting focal point perfect for entertaining guests or just relaxing. They can also help to extend your outdoor season by providing warmth into the cooler months. Of course, it’s always best to check local fire regulations to ensure that it is safe to install a fire feature in your yard. For the perfect garden, just add water! Water features are a great way to transform your summer garden into an oasis. Bubbling rocks, fountains, statues, and ponds can add another dimension to your space no matter the size. If your yard has a pool, consider adding a waterfall feature for the ultimate luxurious look. When choosing flora to put in your garden, blooming plants like Chinese snowball bushes, French lilac, and rhododendrons provide the perfect pop of colour and lend a new dimension to your garden oasis. You can also vary your landscaping to include plants that bloom annually, biennially, and perennially to create an evolving look that changes throughout the course of the year. It’s also important to include plants and trees of different sizes to create more depth. It’s always a good idea to incorporate your existing trees and shrubbery by building your garden around them, using them as the central focus. No garden is truly complete without music. Whether you’re hosting a party, doing some gardening, or simply relaxing, outdoor sound systems are perfect for setting the mood. Most outdoor speaker systems can be connected via Bluetooth making it easy to connect to any device. When choosing your sound system, make sure that it is meant to be used year-round so that it can withstand the changing weather conditions. Why let the darkness drown out your landscaping investment? Use low-voltage lighting to create the perfect garden glow! Incredibly energy efficient, they can help reduce your outdoor electricity usage by up to 80 percent! Some low-voltage lighting can even operate on just a 9-volt battery. Lighting is a key component of your garden as it can be used to illuminate pathways, highlight garden features, and even provide mood lighting in your seating areas. Every garden oasis should have some shade! Adding a pergola or gazebo to your garden provides an inviting focal point that is perfect for lounging, entertaining and even dining. You also get the benefit of a little bit of extra privacy too, even more so if you add some decorative curtains or crawling vines. They also double as a great storage space for your backyard accessories during the colder months. As an added bonus, pergolas and gazebos also help to boost your property value! Often, our summer plans revolve around food. From classic backyard BBQs to formal garden parties, an outdoor kitchen is a perfect addition to creating your garden oasis. An outdoor kitchen will help keep you in the action and cut down on prep time by offering a complete cook station right where you need it most. The best part? You can customize your kitchen to suit your specific needs! Grill island? Check. Pizza oven? Check. Beer fridge? Check! For some outdoor kitchen inspiration, view our photo gallery for some great ideas! A critical component to any garden oasis is a comfortable and inviting seating area. The patio furniture that you choose for your garden can significantly transform the look and feel of an area, so it’s important to first determine how your space will be used. Will you be entertaining guests? Will you use it as a dining area? Answering these questions can help you decide what kind of patio furniture will best serve your needs. For example, if you have an outdoor kitchen, chances are you’ll want patio furniture that can double as a dining area. If your patio is your favourite place to kick back and relax, then amply padded seating is the way to go. Hardscapes are one of the most important garden features you can invest in because they act as a guide in your garden. Get the most out of your hardscapes by using them to define your most important areas. A great way to do this is by using different types of hardscaping for different areas. For example, you can use square flagstone to define your patio and then move to a more natural look as you enter your garden using natural flagstone. If your backyard includes structures like a pergola, gazebo, multi-level patio, or privacy walls, stone veneer is a great way to give your garden a huge visual boost! A great time to consider stone veneer is if you have multiple structures in your garden that were all added at different times. You can use stone veneer to create a unified look that ties all of your important features together! If you’re looking to revamp your garden this summer, check out our photo gallery to get some garden tips and decorating ideas. If you’ve already got some plans in mind, then contact us today and we can help turn your garden dreams into a reality! Written on Friday, June 08, 2018.